You have reached Durablow TR1003 Durablow TR1003 Gas Fire Fireplace On/Off Remote Control Kit for Thermostat and Timer (On/Off + Timer + Thermostat) in Findsimilar! Our expertise is to show you Kitchen items that are similar to the one you've searched. 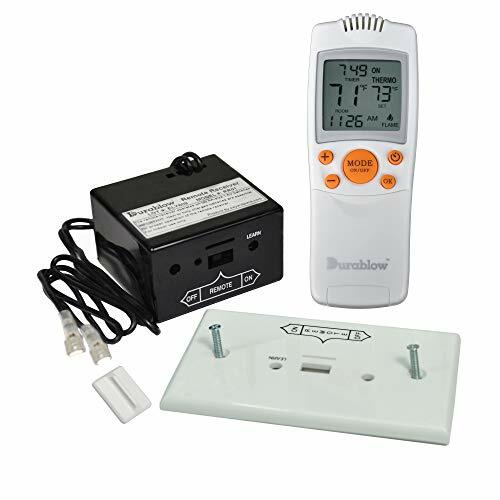 Amongst them you can find Durablow MFB TS120 Fireplace Stove Blower Fan Magnetic Ceramic Thermostat, ON at 120°F (50°C), OFF at 90°F (32°C) approx, Durablow MFB 160B GFK-160 Fireplace Stove Blower Complete Kit for Lennox, Superior, Heat N Glo, Hearth and Home, Quadra Fire, Regency, Royal, Jakel, Nordica, Rotom, Majestic 10002264 Pilot Assembly NG Fireplace Replacement Part by Majestic Fireplaces, Heat N Glo Thermocouple For Heat And Glo And Hearth & Home Fire Places, MENSI 24" Fireplace Millivolt Replacement Thermopile Generators 750℃ temperature resistance, 14D0473 NG ODS Milivolt Gas Fireplace Pilot, Hongso Magnetic Thermostat Switch for Fireplace Stove Fan/Fireplace Blower kit, Monessen 26D0566 Gas Fireplace Thermopile Thermogenerator, Advanced Catalyst Systems Platinum Bright Embers, VICOOL GFK-160 GFK-160A Fireplace Blower Kit for Heat N Glo, Hearth and Home, Quadra Fire, Lennox, Superior, Regency, Royal, Jakel, Nordica, Rotom, all for sale with the cheapest prices in the web.